GJ 876 is one of the most dynamically rich and well-characterized planetary systems. The nearby M-dwarf hosts four known planets, the outer three of which are trapped in a complex 4:2:1 Laplace mean-motion resonance. I conducted a thorough reanalysis of the system incorporating six years of new radial velocity data from four instruments (Millholland et al. 2018). Our new analysis suggests that the system might be in a dynamical configuration that fundamentally differs from that assumed in prior work. I will examine this surprising result in greater detail in a subsequent study of the primordial migration processes responsible for the assembly of the resonant chain. 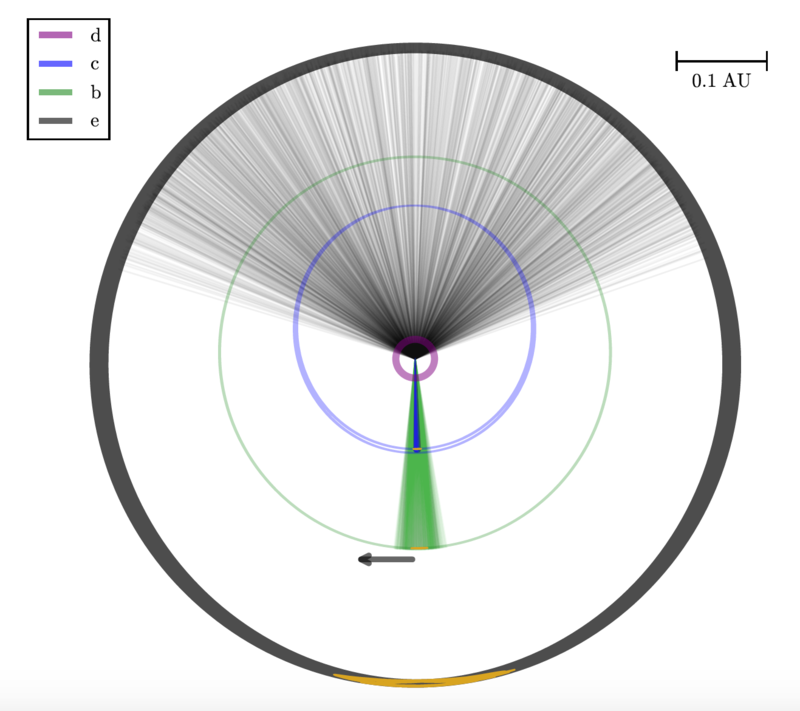 An illustration of the GJ 876 orbital evolution in a frame that rotates with the mean apsidal precession rate (~41 deg/yr) of planets c, b, and e.
The widespread prevalence of close-in, nearly coplanar super-Earth- and sub-Neptune-sized planets in multiple-planet systems was one of the most surprising results from the Kepler mission. By studying a uniform sample of Kepler “multis” with mass measurements from transit timing variations (TTVs), I showed that a given planetary system tends to harbor a characteristic type of planet (Millholland et al. 2017). That is, planets in a system have both masses and radii that are far more similar than if the system were assembled randomly from planets in the population. This clue from the planetary census is both remarkable and mysterious, and in the future I aim to forge a deep understanding of its implications for planet formation. 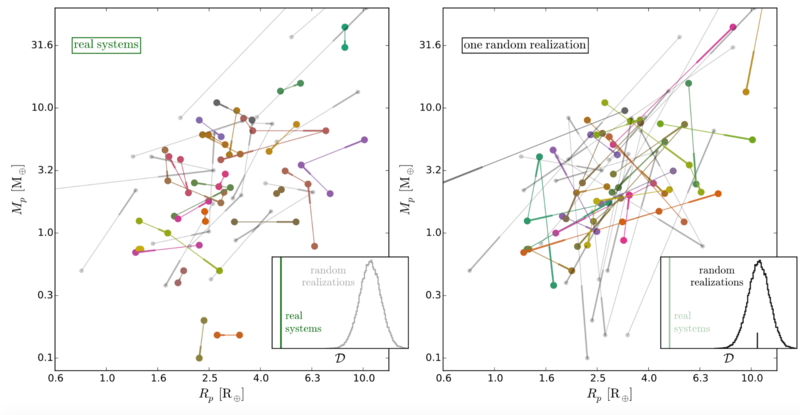 Planets in a given system are more clustered on the mass-radius diagram (left panel) than they would be if each system was assembled randomly from planets in the population (right panel).